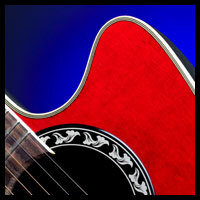 The guitar top is arguably one of the more important factors for budding guitarists to consider. First, it's the part everyone sees. Secondly, it is the resonant qualities of the top which provide the sound....and the tone. And unlike other contributing parts, like strings and nuts and saddles that can be replaced, the top is a permanent feature. Here, we will discuss some of the more popular materials used for tops, and compare laminate to solid wood tops. There are two main types of acoustic guitars. The 'arch-top' and the 'flat-top'. While some of the following information holds true for both types, we are chiefly concerned with the flat-top. At entry level, we find inexpensive instruments described as having 'select spruce' or 'select cedar' tops...These are laminate tops and bear the designation 'select' because these tops have no 'voids' between the layers, and usually have very attractive 'faces' with a tight - grained appearance. 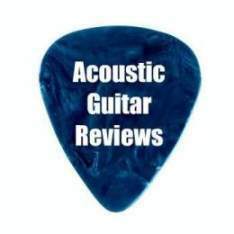 This is a wood product specifically engineered to perform this one function....to provide an effective and attractive as well as durable and inexpensive guitar top. It is light and tough, strong and stable and is remarkably tolerant of changes in relative humidity. Laminates require little care and travel very well so are great if you're 'on the go'. The trade-off is in TONE. Guitars with laminate tops don't 'ring' like those with solid tops. But on a campfire guitar, where clarity and purity of sound are perhaps less important than in an auditorium, these guitar tops are in their element. So if you move around a lot or spend time camping (or both! ), this could be just what you're looking for. And if it gets lost, misplaced or stolen, it's not a big financial loss. 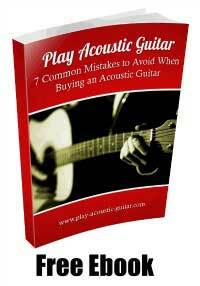 Fine for the cheapest and best beginner acoustic guitar. Great travelling companion. Easy on the pocketbook. Three of the most commonly used species in the manufacture of a solid spruce guitar top - Adirondack. Engelmann. Sitka. Which one is best? Well, each has its merits and its adherents, but wood is a natural substance. As such, it's subject to the whims and vagaries of the weather. Engelmann spruce is GENERALLY considered the best, but this, of course, depends more on the individual piece than the species. Some Sitka or Adirondack samples may be better than some Engelmann ones. More important is the grain. The finer the grain, the higher the quality. Tight grain wood comes from old growth forests. It is stronger and resonates better than pieces with wider grain. Solid spruce guitar tops result in clear, bright tones and chiming harmonics. Bluegrass pickers tend to favour spruce tops, as do most country artists. The bell-like tone fits this style of music beautifully. Folk singers also like solid spruce tops because each note picked rings out and can be heard over the background buzz in coffee houses and other small venues frequented by these artists. 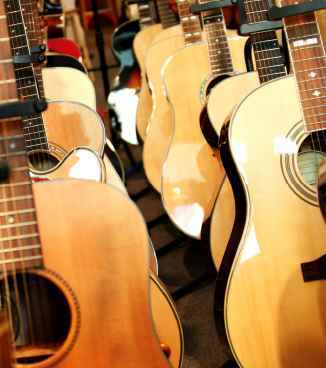 When chords are strummed, solid spruce tops provide a full, rich sound which will fill the room. Mahogany is a tropical hardwood. Its gorgeous colour makes for a really eye-catching guitar top. But mahogany is not just a pretty face. For a hardwood, it's quite light in weight, and its inherent stiffness makes for a very responsive sounding board. Being of a denser molecular structure than either spruce or cedar, a solid mahogany top requires a longer 'break-in' period. It can take upwards of five years. Solid mahogany top guitars, affectionately known as "Hog-tops" by those in the know, are therefore not ideal for the novice. This is an instrument for the more seasoned player. The tones typically produced by a Solid Mahogany Top are usually brighter than a cedar top produces, but mellower than you'd expect from a spruce top. And although the 'ageing' process is slower than that of the softwoods, hogtop lovers are a patient breed. A well-seasoned Solid Mahogany Top will make itself heard in almost any venue and will have shrugged off any tinniness that might have been present when it was new. And a hog can fit into almost any musical genre which calls for an acoustic guitar. Like all solid tops, a hog needs more care than a laminate. A hardshell case is a must, and look at your ambient relative humidity with a view to perhaps purchasing one of several types of guitar humidifiers, which will ensure, with proper use, that your hog maintains it's structural integrity. A Solid Mahogany Top may cost a little more than some other types, but the extra cost and extended break-in period are a small price to pay for such versatility! Cedar is a beautiful aromatic softwood, well-known for lightness of weight, high strength and rigidity. Its lovely, warm, reddish-brown colour is in keeping with the sweet, smooth-as-molasses tones produced by a guitar with a solid cedar top. Port Orford Cedar is a long-time favourite of discerning luthiers. With its fine grain....usually finer than spruce....and light molecular structure, this wood doesn't just vibrate...it SINGS. Even a steel-string guitar sounds gentle with a cedar-top. But with nylon strings.......THAT'S where a cedar guitar top shines. Classical guitars and Flamenco guitars often have solid cedar tops, and it's no wonder! While the tone is gentle, it's still strong. Many folk artists use cedar tops because the tonal qualities lend themselves well to vocal accompaniment...strong and assertive without being strident or overbearing. Solid Cedar tops, like any other solid-tops, need special care. Cedar is strong, but it scratches very easily. While some folk think of these scars as "adding character" to an instrument, you won't want to deface your guitar unnecessarily. Buy a hard-shell case and store your guitar there. A stand is okay for a bathroom break, but don't leave your axe there for extended periods. Also, consider your ambient relative humidity. 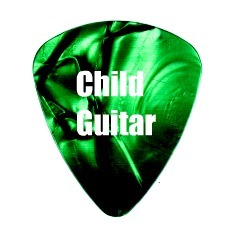 You may wish to consider the purchase of a little device to keep your guitar from drying out and coming apart. Ask your retailer about these gizmos. They're quite inexpensive...and worth every penny in areas OR HOMES with low humidity. While solid spruce tops have the above-mentioned advantages, they cost more than laminate tops and require more care. Solid wood is sensitive to fluctuations in relative humidity, and, depending on the ambient atmosphere, may need a humidifier to ensure that the wood doesn't dry out and shrink. This is especially true of ALL SOLID WOOD guitars. 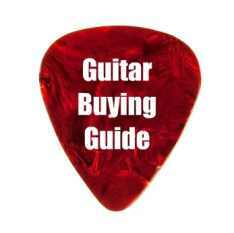 Ask your retailer about guitar humidifiers and choose one which suits your needs and budget. And buy a hard shell case. Do NOT store such an instrument on a guitar stand! If you can 'baby' your guitar, have NO intention of taking it camping at the lake, and really want a super sound, a solid spruce guitar top is highly recommended and definitely worth the extra cost. Generally speaking, the finer the grain, the older the wood and the higher the quality. The term 'select' is used to refer to laminates of superior quality...that is with no 'voids' between the layers. Spruce is a softwood and so is cedar. Both are excellent tonewoods with cedar USUALLY providing a mellower tone and spruce a brighter one. Cedar makes a nice 'flamenco' guitar....spruce makes a better bluegrass axe. Solid wood makes for better instruments given that all else is equal....but these require more care...as mentioned before with regard to humidity. Cedar scars very easily, so it's NOT recommended for kids or for campfire guitars. Spruce and cedar are light and stiff and strong. They resonate well, so are in great demand for tops. The newer trees are farmed, grow quickly and have big growth rings. Old growth trees came up slowly, have a MUCH finer grain and are therefore better.